Lodging is part of the Cloud 9 Inns Group. Cloud 9 Inns are friendly, clean, and quiet places to stay for a night or a month of nights. They are NOT "cookie-cutter" lodging facilities. Each one is unique. Every Cloud 9 Inn has a 24-hour front desk. Someone is always available to help you at any time of the day or night. All rooms are NONE-CLEANER ROOMS(tm). There are no cleaner rooms in any lodging facility. 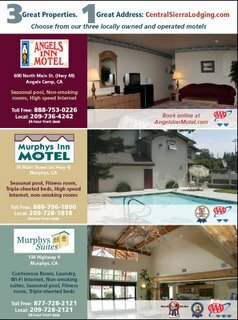 Murphys Inn Motel and Murphys Suites in Murphys, California; and Sutherlin Inn in Sutherlin,Oregon.